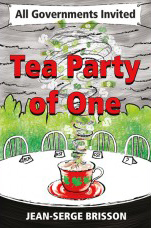 I had the pleasure of attending a Libertarian conference this month where I picked up a copy of a book called Tea Party of One – All Governments Invited, the newly released book by Jean-Serge Brisson. I have known Jean-Serge for a few years and so I knew a little bit about how he fought the government and won – at least for now. His story begins when, as a young man, he starts his own business. Things go wrong for Jean-Serge, and I would have to say, for the government, when he starts to challenge the constitutionality of the requirement for businesses to collect and remit sales tax. You would expect a story about opposing government (three levels – municipal, provincial, and federal – in this case) to be a bit dry. Not this book! It is a fascinating story and it is told with a lot of humour, which, despite the seriousness of this subject, makes it a very entertaining read. This is the story of one man who takes on the big guys and doesn’t give up. It is an inspirational story – not many of us would have the intestinal fortitude to stand alone for 23 years and counting. It’s also a story with a twist – when you purchase the book directly from Mr. Brisson, it comes with an invoice from his radiator business which clearly states: “This firm does not collect taxes. If you feel this tax should be paid you may send it yourself”. Get the book – read it – you’ll understand. The book is available from Chapters and from the publisher General Store Publishing House (GSPH) in Burnstown, Ontario. Better still; buy it directly from Mr. Brisson. You can contact him at 613-443-5423 or 613-762-8195 to obtain a signed copy.